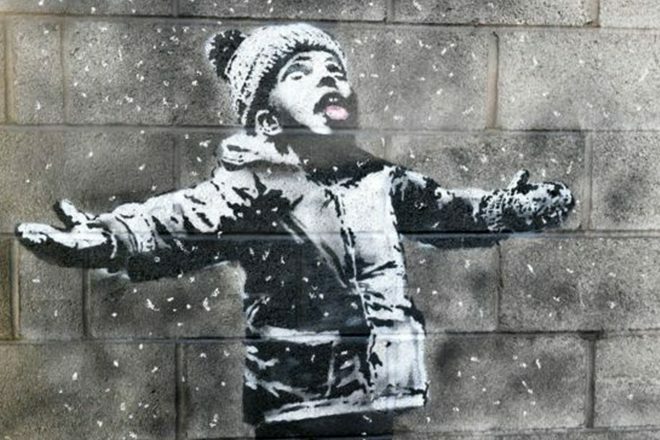 A new spray-painted stencil from the renowned street artist Banksy has cropped up in the Taibach area in South Wales, UK. A video of this latest work appeared on Banksy's Instagram account. It portrays a child wearing winter clothing with a sled at his feet who is sticking his tongue out to catch snowflakes. As the camera pans out, it shows a dumpster fire on an adjacent wall with ashes and smoke pluming upwards and falling on the child who believes the ashes he is catching on his tongue are actually snowflakes. The caption on the video simply reads "Seasons Greetings." The choice of location for this new work can perhaps be linked to the fact that Port Talbot was recently named “the most polluted town” by the World Health Organization back in May. WHO has since redacted their statement and admitted the figures it published were wrong, but a third-party study conducted in October found that the town is still very much "over the limit for air pollution limit." BBC News has revealed that Port Talbot local, Gary Owen, messaged the artist on Instagram back in August to see if he could do some artwork to highlight the town's pollution problem. Check out Banksy's new spray-painted stencil below.